with a share capital of one million and two hundred thousand lira. looking for better luck. Just after world war one he met Ettore Ambrosetti, his future partner. exciting business venture. This was the official beginning of the remarkable Borrani wire wheels story. fixed by one central lock nut. and commercialization of "wheels for cars, motorbikes, cycles and equivalent"
as per the notary act at the Chamber of Commerce. their racing and luxury road cars with Borrani wheels. from Bianchi and Lancia to Alfa Romeo all driven by his loyal driver. as he was convinced he would be too distracted to be able of sit behind a steering wheel! 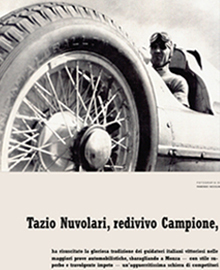 The association with Enzo Ferrari started from the beginning during the 1924 "Coppa Acerbo"
equipped with "Rudge Whitworth-Milano" wheels. 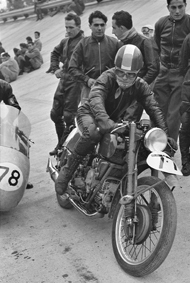 motorcycles and later with his own Ferrari production. the main characteristic of a Borrani wheel. During 1937, after a few weeks of illness, Carlo Borrani died, aged only fifty. 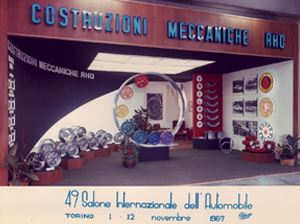 His son Cesare, a young engineer, took over the company. to modify its name from "Rudge Whitworth-Milano" S.I.R.S. (Società Italiana Ruote Smontabili) into Carlo Borrani S.A.
with the new Civil code (Regio Decreto March 16, 1942 nbr. 262). hydraulic control systems, shocks, fuel pumps and of course wheels. This was directed by a branch of the company based in Rome, Italy called "Sezione Avio"
that carried the traditional Borrani hand logo with the addition of a pair of wings. and Ford (for its famous GT40) plus many others in the racing field and for road cars. and motorcycle wheel production numbered five thousand wheels per month. 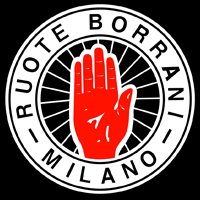 Ruote Borrani - Milano as a new branch of CMR, but still keeping its traditional hand logo. (Vanwall and Ferrari) between 1950 and 1961.
was the 1961 one by Phil Hill, Ferrari 156. The late 60's and early 70's for Borrani was a period of great change. a change that had occurred in racing circles about 10 years earlier. used the Borrani "RM Record" wheels such as BSA, MV Agusta, Guzzi, Harley Davidson, Gilera etc. that were in need of replacements or refurbishment of original wheels. where it has been relocated and separated from CMR. keeping alive its long and rich tradition. April 22, 1922 is an historic date for motorcycle industry. and racing motorcycles, for over fifty years. an incomparable product for strength, lightness and precision. factories, for prestigious models and for their racing motorcycles as well. 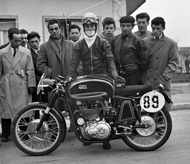 the whole thirty-seven World Championships won by MV Agusta with Giacomo Agostini and other unforgettable champions. from Moto Guzzi Falcone Sport to the Gilera Saturno Piuma. What all these motorcycles would have been without a pair of Borrani's Record rims? when the patent was bought by Carlo Borrani in 1922.
this was a mythic symbol used in the north side of Ireland, the Ulster were he came from. adding to it as back ground a wire wheel. so a boat race was called in and who will touch first with his hand the shore of Ulster, shall be the king. this is the reason of the color of the hand. red as blood. There are several variants of this story but the "Red Hand" is indeed an Irish Symbol.